We’re lucky to live so close to the water, but sometimes this perk requires a little extra upkeep. We’re happy to provide quality year-round shoreline restoration to all of our lakeside customers. If your home is built on a slope, you’ll likely need to make use of retaining walls to keep your natural beauty from overgrowing or spilling over. We offer both building and repair services for retaining walls. Nobody wants to be cooped up inside on a beautiful summer day. That means you’ll need an area to sit, relax and enjoy your outdoor property. 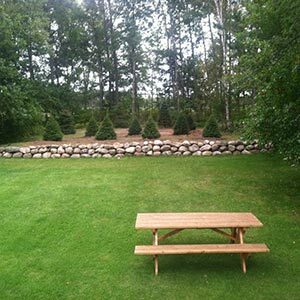 As one of the most experienced landscaping companies in Brainerd, MN, CJ’s Landscaping Company, LLC is the perfect choice to build or repair your patio or walkway. During the warm summer months, it becomes especially important to keep your lawn well hydrated. Let us take care of installing and maintaining your irrigation and sprinkler systems. Nothing’s better than sitting under a big shady tree on a warm summer day. We happily provide general tree care, as well as tree installation and tree removal, for all of our valued customers. To maintain the health of your soil and make sure everything in your backyard stays beautiful and healthy, trust your sodding work to CJ’s Landscaping Company, LLC. We’ll get the job done quickly, affordably and professionally.